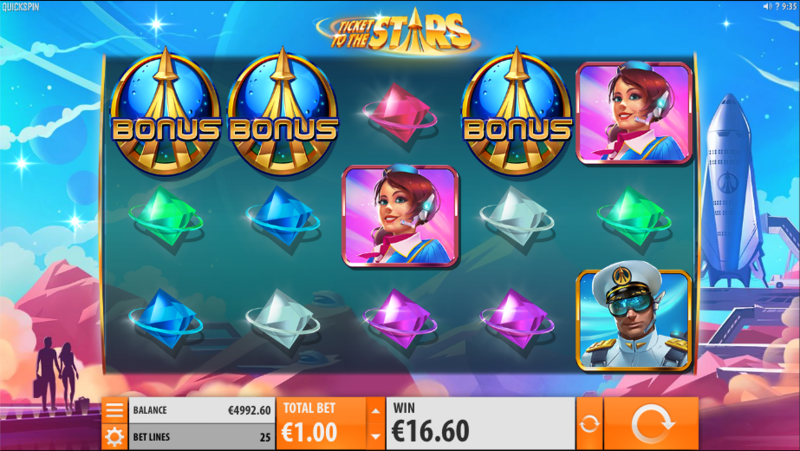 Let’s step forward to a time when intergalactic travel is as easy as buying a ticket and stepping onto the rocket – that’s the theme of Ticket To The Stars, an online slot from Quickspin Gaming which offers interstellar free spins and Swooping Reels. Ticket To The Stars is a five reel slot with three rows and twenty five fixed paylines; those reels spin in front of a spaceport on some alien planet where two travellers are preparing to board the rocket which will transport them elsewhere. The higher value symbols include the captain of this vessel, a member of the cabin crew, a robotic waiter, champagne on ice and a suitcase; gems in red, purple, green, blue and grey make up the lower values. The wild is a golden ticket which will substitute for all other symbols except the bonus to help form winning combinations and it appears stacked on all reels. This is a feature we always like and it occurs with every winning combo – those symbols involved will disappear to allow more to fall in from above and any new wins will follow that process. This feature ends when there are no more wins. This is triggered by landing three, four or five of the bonus symbols anywhere in view for which you will receive 15, 20 or 25 free spins respectively; a multiplier meter springs into action here and with each third win it will increase by 1x with no maximum – that multiplier will then be applied to every subsequent win. Each bonus symbols landing during this round will award an extra five free spins and each multiplier increase will award two more. Ticket To The Stars is not only a very enjoyable slot, it’s also a nod to a more hopeful future, even if it’s a long way off; it’s designed to Quickspin’s usual high standards with two clever features and it comes highly recommended.